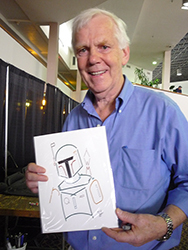 Boba Fett himself, Jeremy Bulloch, holding one of Bradd's sketches! 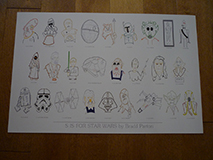 We recently had the privilege of having artist Bradd Parton answer a few questions about his work and career. We would like to thank Bradd for taking the time to answer our questions and we hope you'll be inspired by his unique approach to art. How long have you been an artist? How did you get started? From a very young age I've always enjoyed drawing. From middle school through college I drew lots of t-shirt designs, annual (yearbook) covers, and newspaper cartoons for school. I've been doing the convention circuit for about 4 years I guess. Could you tell us about some of your work? What styles or subject matter do you prefer? I like lots of different styles and mediums, but currently I'm spending a majority of my time on a technique I created called "Alpha-Sketch." 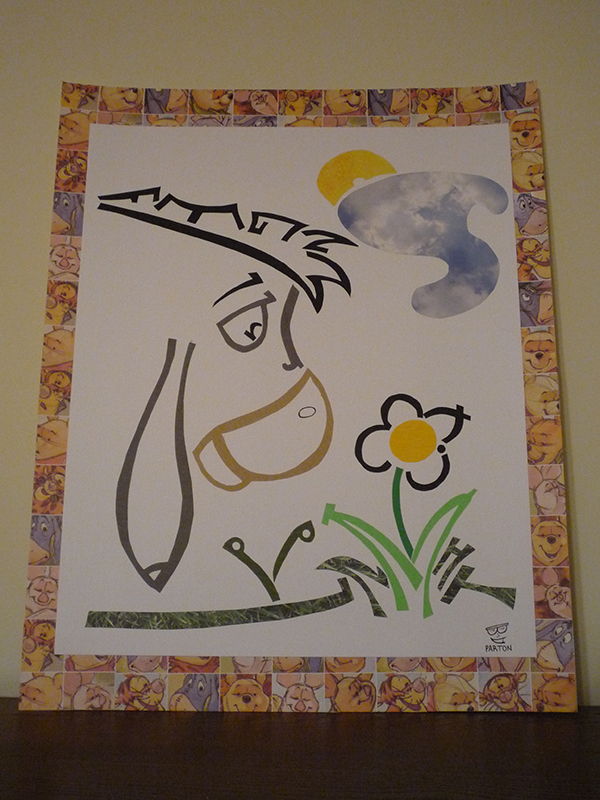 Essentially, an Alpha-Sketch is a drawing made using only the letters of the alphabet. Every drawing is comprised of 26 lines (each of which is a different letter). All letters are hidden in every drawing. There are no extra lines, omissions, or repetitions. Inspiration could come from anything for me. Films, other artists, music. 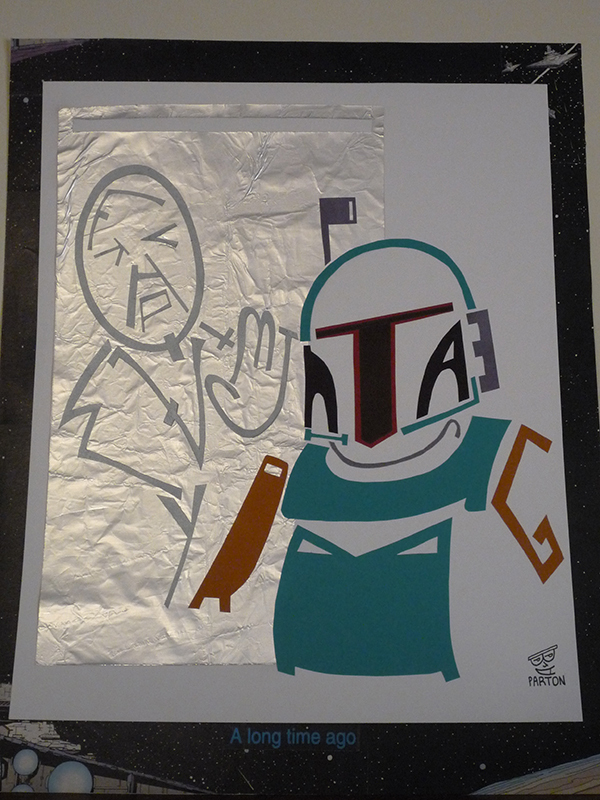 Someone reviewing your portfolio will find a great many pieces relate to Star Wars and Indiana Jones. Have you always been a fan? If so, do you have favorites among any of the films? I've been hooked since I saw Episode IV theatrically in the 80's. I would probably have to go with Empire as far as a favorite. 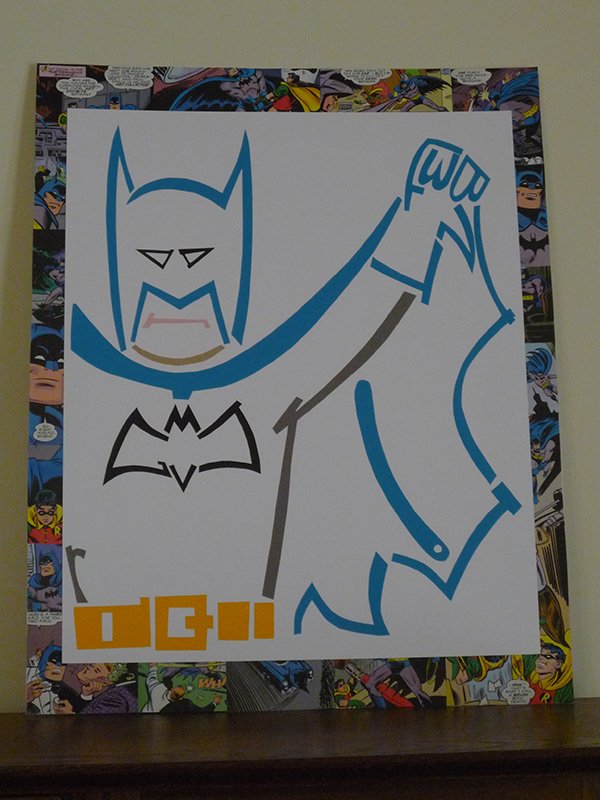 You also have a great many comic book heroes that you sketch. Do you have any favorite characters? I like most of the characters I draw, but Batman and his rogue gallery (particularly Scarecrow and Hush), Batgirl, Aquaman, Godzilla, Plastic Man, and Swamp Thing are probably my favorites. Are there any artists that inspire you; if so, why? Charley Harper, Eric Carle, Jack Davis, Bernie Wrightson, Bill Watterson, Al Hirschfeld...all masters of their mediums. Without giving away trade secrets, can you walk us through your process of creating a new piece of art? My basic approach is to start with a pencil sketch which is then scanned into the computer for use in Flash. In Flash (or sometimes Photoshop or Illustrator), I will then digitally ink and color what I drew. If I'm creating a collage, I'll sketch the character small making sure I've used all the letters. Then I'll re-sketch the drawing at a bigger size to make a pattern for paper cutting. What have been your favorite projects to date and why? Probably "F+"... It got a great review on Ain't It Cool News in their comics column. It's more of an illustrated short story than a comic. It's something I wrote and drew. 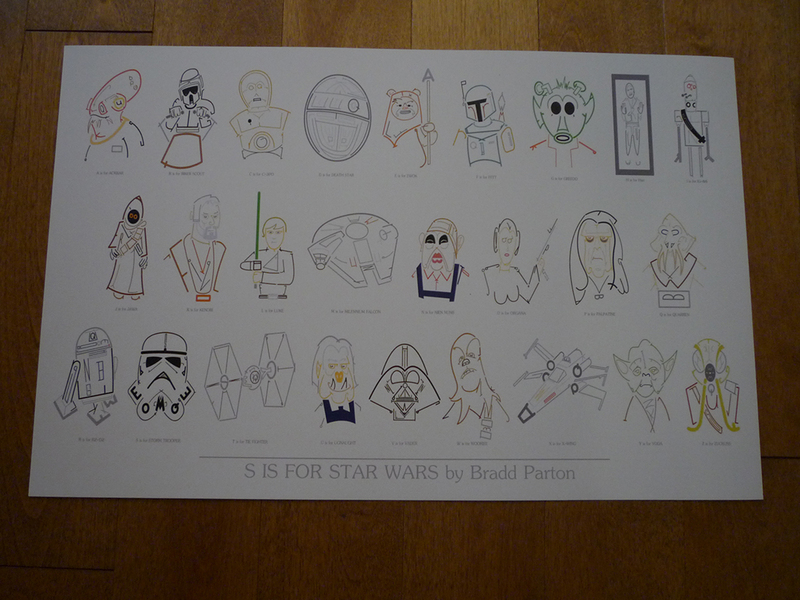 Can you find all of the letters in Bradd's work? What was/were your favorite class(es) in school? Band in middle/high school, Orchestration in undergraduate, and Music Technology in graduate school. I have no formal art training. Does any teacher stick out in your mind as having an impact on your life? Every teacher has had an impact on my life, some in positive ways, others not so much. George Wenger, Frank Watson, Dan Ellis, Les Hicken, and Bill Moody are all positive standouts. What advice would you give students pursuing a career in art? Three Things: Only do it if it's fun. Meet deadlines. Don't work for free. Professionally, where do you hope to be in ten years? I'd like to have some of my books published by that point. Visit Bradd's website to learn more or to see his latest projects.